At the end of a long day, did you ever wish that you could slip your PC into your pocket, rather than your backpack? ICE Computer says that vision will be a reality by summer--but it needs your help. ICE wants to raise $300,000 via Indiegogo to fund the final development of the ICE xPC, a modular computer whose basic core can slide into a variety of docking stations from a tablet, to a notebook, to a desktop. ICE says that "early birds" will be able to buy the xPC desktop adapter and xPC itself for $369 including a Windows 8 license, and up to $579 for a bundle that adds a 10.1-inch tablet sleeve to the mix. 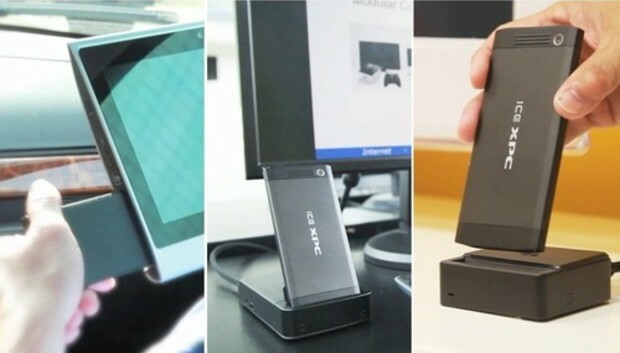 The company hopes that instead of lugging around a bulky laptop, consumers will choose to slip the 4-ounce xPC into their pocket--at 4.87 inches by 2.31 inches by 0.35 inches, the device is about the size of a smartphone--and simply take their office with them. Over time, the company says it hopes to build a smartphone that simply adds a display and cellular radio to the modular concept as well. A truly "disaggregated PC" that separates the storage, CPU, and graphics adapter is largely the province of the desktop PC, where users can swap out a graphics card, for example, and upgrade it with a newer model. But allowing the core components--CPU, core logic, graphics, storage--to roam into different form factors has been discussed since the IBM Metapad, in the 1990s. Recently, Microsoft began talking about its new Surface tablets as the engines of both desktop and personal computing. On the specifications front, the xPC is reasonably powerful. The latest xPC will include a four-core Intel "Bay Trail" Atom chip, the same found in the most recent generation of two-in-one PCs, as well as between 2GB and 4GB of RAM and 32GB to 128GB of SSD storage, depending on the configuration. The xPC will also house 802.11b/g/n Wi-Fi, a 720p camera, and a female "xPDMI" connector, a CEA-designed connector designed to run 1080p video, USB 3.0, as well as power over the same interface. ICE also released the specifications of the ICE xPad, a 10.1-inch tablet "sleeve" with a slot to insert the xPC. By itself, the xPad contains a 10-point, touch-enabled display with resolutions of either 1960 x 1200 or 1280 x 800. It will also contain between 32GB and 128GB of additional solid-state storage, another 720p camera, and a 30 watt-hour battery. Two USB 2.0 ports as well as an HDMI connector will provide external connectivity. All told, it should weigh 1 pound, 8 ounces (700g) without the xPC inside, according to ICE. ICE's development timeline says that the company will wrap up the schematics and layout of the Bay Trail design this month. Firmware will be installed and tested in February, and the company will send out beta samples in March. By June, the company claims, the xPC will be in mass production. It's worth noting that xPC has pushed the concept of a modular PC for more than a year now, so there's no guarantee (as with anything on a crowdfunded website) that the final product will ever see the light of day. And there's another concern: the disaggregation of data. While a Word document was essentially confined to a computer a decade ago, working on a phone, tablet, PC, or other device is relatively common in the modern era of cloud storage. Users may simply find that they need not replace their existing PC/smartphone/tablet hierarchy with a solution from a startup. While ICE offers an interesting argument--ditch your laptop for a CPU "sleeve"--many have already made that leap, via their smartphone.